Located between Falls Lake and Kerr Lake and close to Durham, the Oxford AA Self Storage branch is your local resource for standard and climate-controlled storage space. Our Oxford storage facility features RV and boat storage, a range of unit sizes, as well as space available for commercial clients. 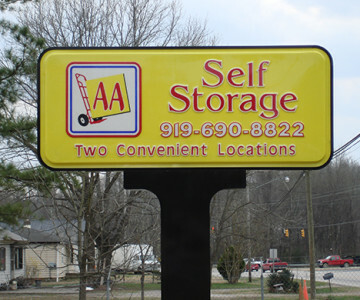 Contact the AA Self Storage professional management staff today to learn how we can fill your storage needs. Click here for directions to our Oxford location.